in the cockpit of N220AM. in the cabin of N220AM. 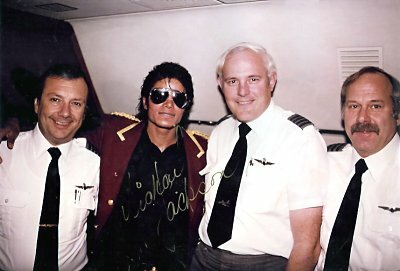 Two of Airmark's Flight Attendants with Michael Jackson in the cabin of N220AM. Lynn DeGrasse (Daugherty) on the left and Vicki English (Maynes) on the right. I was employed by Airmark Corporation in March 1982. We were a private aviation department for a wealthy person in southern California. We were based at Burbank, California (KBUR). At that time, we were only operating a Gulfstream II N21AM. In order to offset operating costs, we placed the G-II on an FAR 135 charter certificate. The owner wanted an extra mode of transportation in the Los Angeles area, so a Bell Jet Ranger helicopter N221AM arrived, and we also made it available for charter. The owner had purchased a very large ranch east of Perth, Australia, and wanted a longer range aircraft with more than two engines. A search was made in the summer of 1983, and N138TA (ex VH-EBA) was purchased from Tiger Air on 16 October and later re-registered N220AM. During that period of time in the aviation world, Tiger Air had been very active in converting BAC-111s, and a couple of Boeing 727s and 707s into corporate aircraft. The 707 was the choice for those individuals who needed the extra range. N138TA was a special project for Tiger Air as they actually purchased the aircraft and converted it on their own for resale. They did not realize the noise issues were soon to devastate the 707 market. They chose the 138B for its size and fuel capabilities, which translated into range. Since it was outfitted for only 34 passengers, there were extra fuel tanks added in the forward and aft baggage compartments. They were all the same size and similar in shape to the potable water tanks in the aft hold and were hung from the floor above. I believe there were 9 total. 6 aft and 3 forward. With all 9 installed, the forward hold could take no baggage and the aft hold was only useable from the aft end (edge) of the baggage door to the front of the aft hold. There was a 9G barrier just at the aft end of baggage door so that baggage could be placed in the forward part of the aft hold. I don't think there were gauges for these tanks. I think there were lights indicating valves were open or shut (bleed air and aux tank to main tank valve). As I recall, we could put a maximum of 130,000 pounds of fuel on board. The fuel tank system was unique in that we could use just about any combination of the tanks required for the mission. There were some weight and balance issues if just the forward, or just the aft tanks were used. The fuel was pumped using engine bleed air from each tank into the center fuel tank in the wing. We rarely used the auxiliary fuel system, but a friend, the late Ron Rounce, flew the aircraft for Prince Bandar and told me they used them all the time without problems. The engines were updated to the Pratt & Whitney JT3D-3B fans (18,000 lbs of thrust each) and an APU was added in the forward baggage compartment. Unfortunately, the APU did not produce enough air on the ground for air conditioning, so external carts had to used for conditioned air. There was an aft airstair, which made the aircraft "self contained" except for ground air conditioning. Those air stairs were the best that were ever installed on an airplane like this. I have used others on 707s and 727s that only worked about half the time. The galley was full VIP with sterling silver service utensils and serving tools. Limoges China and Waterford Crystal were used in the dining and lounge area. There was a four place round table at the forward part of the lounge area. The seats were covered in a very expensively tanned and produced pig skin. According to a popular story which circulated around Burbank for many years, this choice of covering severely limited Tiger Air's sales propects in certain parts of the world. In that same area, there was a beautiful brass outline of the world on the forward bulkhead. Televisions and the latest (for the day) VCR equipment were located in the passenger areas. View the cabin of N138TA. The cockpit was equipped with the latest (again for the time) radios, radar, and navigation equipment. We had dual Delco Carousel IV-INS units, plus a GNS-500 VLF as a backup. 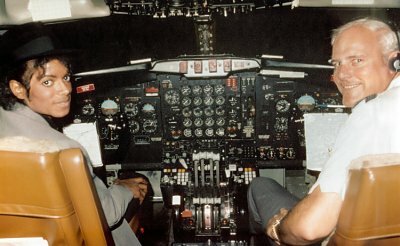 The rest of the cockpit was standard Boeing except for the sheepskin coverings on the seats. We began operating the aircraft under an FAR 125 certificate while we were undergoing certification as an FAR 121 Supplemental Air Carrier. We were awarded 121 worldwide operations specifications in July 1984. We moved the 707 operation to an American Airlines maintenance hangar at Los Angeles International (KLAX) in June 1984. Our first big charter was the Michael Jackson Victory Tour, which started on July 6, 1984 in Kansas City, Kansas and concluded on December 9. 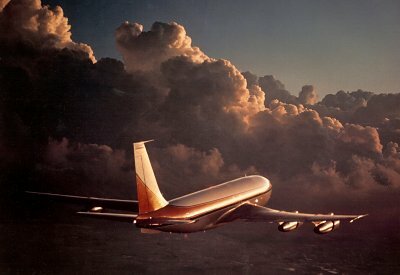 Although the Jacksons used road and rail for some sectors of the tour, Airmark did all the flying with the 707. There were usually no more than 10 passengers on the aircraft. During the course of the Victory Tour, N138TA was flown to Tramco at Everett, Washington for maintenance, arriving on August 10. The aircraft re-emerged on August 20 under the new registration N220AM. While we were on the Victory Tour at Vancouver, two teenagers actually "broke into" the aircraft while it was parked on the ramp. I don't remember the handler or FBO we used at Vancouver, but they noticed an over wing exit open at night and called the police, who caught the kids. The police did a thorough search including a bomb dog walk through. They did not vandalize the aircraft, as they were only interested in seeing Michael Jackson's plane. I met with the father of one of the teens who was very upset and concerned that we would press charges, which we did not. We also alerted Bill Bray, the chief of Michael Jackson's security. They thought it was funny and actually gave the kids free passes. After the Victory Tour, we flew the owner on several trips, plus charters to New Zealand, Japan, France, and England. Other clients included a Saudi Prince (not Prince Bandar) and a group of executives from the Diamond Shamrock oil company. The stage 3 noise regulations grounded the aircraft as of 31 December 1984. However, Airmark had a firm deposit on a Stage 3 hush kit, and was given an exemption to continue operating the aircraft in the USA until 31 May 1985. The exemption stipulated that we could only operate to the same airports we had serviced in 1984, so for a charter operation, it effectively shut the operation down. The lawsuit and subsequent exemption are still used today as a precedent in other exemption suits against the FAA. The hush kit we had planned on never materialized. However, Community Transport, San Antonio, Texas was successful in producing a stage 3 hush kit for the -300 series 707. They saw sales in the -100 series, but the FAA was requiring them to actually use a -100 in their testing. Due to market conditions, and the effective grounding of the aircraft, N220AM was sold to Community Transport in January 1985. I delivered it to them in San Antonio on a ferry permit during that month. CT was owned by Morris Jaffe and operated by his son Michael Jaffe. They also wanted to operate, or sell the aircraft after the hush kit certification. HRH Prince Bandar bin Sultan (Saudi Arabia’s ambassador to the USA) purchased the aircraft in August 1986 as an upgrade from his Boeing 727. The 727 was registered HZ-122, and the 707 became HZ-123. The aircraft was based at Page Aviation, Washington Dulles (KIAD) and was actively in service until the Prince took delivery of his Airbus A340. It was actually parked directly outside the ramp side door at Page Aviation and everyone who arrived or departed from there saw it regularly. As a side note, there was a retired USAF Chief Master Sergeant, Paul Talbot (believed deceased) who was with the -138B from the time Tiger Air purchased it from Pacific Western all the way through until it was retired from Prince Bandar’s service. He was a fantastic flight mechanic and helped in all maintenance areas. He knew the aircraft inside and out. Coincidentally, I also flew N707KS (ex VH-EBG) when I was with Skyways International operating out of Jeddah, Saudi Arabia. Note: This summary is based on the only Airmark log book thus far located. It is hoped that others will emerge. David Rowland retired from flying in April 2008. Prior to retirement he was with a private group in New Orleans, Louisiana managing and flying a Gulfstream III and subsequently a Gulfstream 450. He holds type ratings in the Boeing 707/720/727/737, BAC-111, G1159 (Gulfstream 2, 2b, and 3), NA265 (Sabreliner), and the G-V (Gulfstream 350/450/500/550). He also holds a Commercial helicopter license, and an Airframe and Powerplant mechanics license. David is currently a Licensed Homebuilder and builds one or two houses per year. 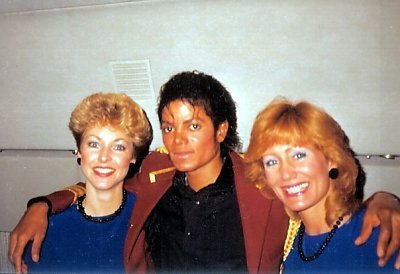 Added an image of two of Airmark's Flight Attendants with Michael Jackson.